A Moorish style kiosk with some busts. The orangery museum which contains relics of the Napoleonic era. Ristorante alle Darsene di Loppia di Gramatica Matteo. How popular is The Garden Of Villa Melzi Or I Giardini Di Villa Melzi? 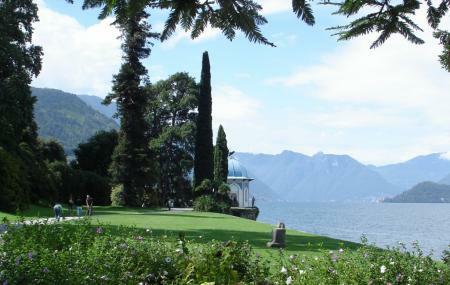 People normally club together Bellagio and Monte Bre while planning their visit to The Garden Of Villa Melzi Or I Giardini Di Villa Melzi. This place is breathtaking. Definitely worth the visit if you're in Bellaggio. We only had 30 minutes to explore as the gardens were closing for the day, and saw most of it. I recommend going early to get the best light. If I could, I would rate with 10+ stars. This botanic garden is one of the most beautiful things I have ever seen in my life. Absolutely stunning. Words and pictures can't describe. Go and see for yourselves. A beautiful, quaint garden in a small hamlet in Bellagio. Acres of well manicured lawns are dotted with colorful flower plants and Gothic structures and a villa. It's kissed by the gentle waves of Lake Como on one side and rises up on a hilly slope on the other. I visited right at the beginning of Spring! It is a beautiful place. You will have great views of the lake, flowers, mountains and buildings! Nice place but may be difficult uphill climb for perdo s with walking issues. Tickets are for museum and gardens together. Wish they give you option to select, if needed.